I must admit, alarm bells started ringing when the opening death of the week was seemingly perpetrated by a possessed pick-up. I mean, we all remember the racist truck from Season 1’s Route 666, right? This time it wasn’t a phantom vehicle, but a ghost communicating through a smart phone’s navigation app. When two more students from the same college are killed, one strangled by a laptop cable and one brain-fried by wireless speakers, Sam and Dean must lean on the fourth member of their clique, Delilah, to reveal the secret they have all been complicit in. Delilah admits they were responsible for causing the car accident that killed a local man, Andrew, when he was run off the road and into a utility pole. While Dean tries to keep the surviving teen from becoming the ghost’s final victim, Sam deduces that the dead man’s spirit has been transformed into pure electricity, and is using Wi-Fi as a conduit. It takes a tearful plea from his widow to stop his murderous rage, and he is finally able to find peace. A pretty straightforward monster of the week episode, this one. Atmospherically, it felt very much like an early season installment, which I loved, although the references to ‘Millennials’ and ‘Gen X’, as well as current music cues (Hozier’s Take Me To Church) planted it firmly in the here and now. I actually think Supernatural works better when it avoids too many ‘real world’ references, as it did in the early years. Very specific pop culture nods are especially problematic in terms of the Supernatural timeline. While we have jumped forward whole years between seasons, we still seem to be in 2015, and that’s jarring to viewers who have more than a casual relationship with the show. This episode clearly intended to poke fun at the world of social media and our modern, slavish devotion to our devices, but there were little inaccuracies that meant it didn’t wholly work as satire. Dean telling Sam to Google something when Sam is always seen using a fictional browser did amuse me, but the high-speed and HD video call in a basement with supposedly bad reception threw me out of the story. Referencing movies such as Christine and Lawnmower Man highlighted that Sam and Dean are not spring chickens anymore (and neither am I, sob), and that they’ve been on the road for a really long time. Sam has always been depicted as something of a techno-geek, albeit a Gen X one, and his ability to hack computers and complex systems reemerged in this episode, which was refreshing. Dean’s tongue-in-cheek apology for pulling Sam out of college was almost throwaway, but actually recalled the pilot episode, and underscored just how much mileage the boys have notched up since Sam was a student. Reading between the lines, it was surprisingly poignant. While Dean has always been more stubborn about embracing change, preferring classic cars and his tape deck to Sammy’s iPod, earlier this season he was caught using a dating app, and he uses smart phones these days, so his regression to the junk food scoffing horn dog we first met in the pilot felt like a deliberate attempt to recapture the ambience of a simpler time – before angels and Leviathans. Dean’s speech to Sam in the Impala in the closing moments almost ‘reset’ his character after his time as a demon and his attempts at clean living to control the Mark of Cain. 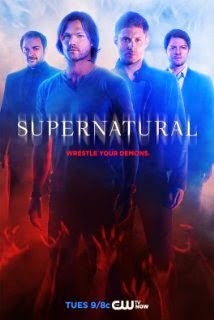 It was like revisiting Season 3, with Sam desperate to find a get-out clause, and Dean resigned to his fate and determined to ‘go down swinging’ with a fixed smile on his face. It seemed fitting that an episode which contained so many echoes should be a ghost story. The truck plunging off the broken bridge was visually reminiscent of the pilot episode. Dean telling Delilah she’d need to confront her horrible mistake and deal with it by trying to do the right thing reminded me of Sam going into the building to rescue people just before saying ‘yes’ to Lucifer, and of Jo Harvelle’s ghost telling Dean to forgive himself in Defending Your Life. Andrew’s decision to go in peace mirrored Bobby’s. And, most importantly, Sam and Dean have reached the point in their endless cycle where one of them is faced with the imminent loss of the other. The difference now is that they are talking honestly about it, and that’s progress. They say familiarity breeds contempt, but a salt and burn, a ghost, gambling Cas, hedonistic Dean, smart Sam, and brotherly tenderness in the Most Important Object in the Universe, and I’m in my own special Roadhouse Heaven. It wasn’t perfect, but it had heart. This entry was posted in Uncategorized and tagged horror, review, Supernatural, TV, Winchesters. Bookmark the permalink.